14mm carbon potentiometers with plastic housing and Ingress. Protection rating type IP 54 (high level of protection against dust and also against water splashing), according to IEC 60529. Plastic materials can be self-extinguishable according to UL 94 V-0 under request. - Click effect (up to 38 detents available). - Electronic household appliances, heating, ventilation and air conditioning (HVAC) equipment, thermostats. - Automotive: HVAC controls, lighting regulation (position adjustment and sensing), dimmers, seat heating controls. 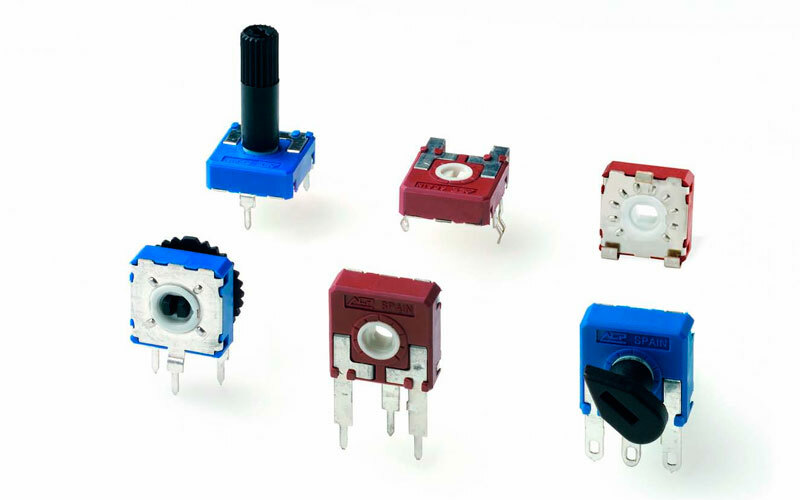 14mm cermet potentiometers with plastic housing and Ingress Protection rating type IP 54 (high level of protection against dust and also against water splashing), according to IEC 60529. Plastic materials (housing and rotor) are self-extinguishable according to UL 94 V-0. ACP’s cermet potentiometers have better thermal stability, allow for higher thermal dissipation and withstand higher temperatures than carbon potentiometers. - Electronic appliances: boilers, water heaters. - Automotive: climate controls, position sensors.